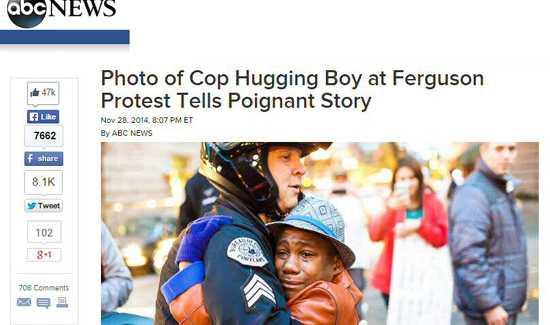 The media loves the “them versus us” narrative because it sells papers and drives web traffic. But it’s an exit to nowhere, in terms of the work that lies ahead. Cops feel like they’re under attack, and some people feel like they’re under attack from the cops. Any time you start hearing complex issues reduced to “pro-police” and “anti-police,” it’s cause for serious alarm. The reason it’s so troubling is it’s a kind of tribalism, as opposed to the democratic ideals we claim to hold so near and dear. So, is it possible to have issues with specific incidents involving police officers, use of force, and other dynamics without being “anti-cop?” Obviously, it depends on who you ask. But with emotions running this high, you’re far more likely to hear from an 18-year-old kid chanting “dead cops!” or a cop on Facebook talking about “the animals in the street” than someone that takes a more complicated view. The media, such as it is, is about giving voice to the angriest people talking the loudest. Fortunately, the angriest and loudest individuals constitute a minority. In Des Moines, Iowa, Ammar Saadiq is a local activist, and he’s black. But he’s also a supporter of police. His cousin’s a cop. Saadiq and hundreds of others recently marched in support of police officers, despite the fact that some of the “pro-police” protestors reserve their right to criticize specific incidents, agencies, and officers as they see fit. With so much “us vs. them” talk in all quarters, it sure is refreshing to listen to someone who has something beyond the “for or against” routine that drives a lot of web traffic and increases ratings, yet only serves to divide and enrage us when connections and cool heads might be part of what the doctor ordered, so to speak.